For our measurements, we use the E-MU0404 USB sound card. Its DACs and ADCs support samples rates up to 192kHz and up to 24bit precision. But how good is the card really? We did a short loopback test with inputs directly connected to the outputs of the card. Unfortunately only unsymmetrical cables were available. The diagram does not show the noise component, because it is almost non-existent. The datasheet states -117dB. All higher order distortion components (D4+) and D2 are below 0.001%, only D3 is above 0.001% above 1kHz, with a maximum of about 0.003% – very good. But why didn’t I use 192kHz sampling rate? Most DACs and ADCs have their lowest distortions at the lower sample rates. Does this also happen with the E-MU 0404? This looks almost as the 48kHz measurements. There is a small glitch, but I’m not sure if it comes from the card or the measurement setup (software?). 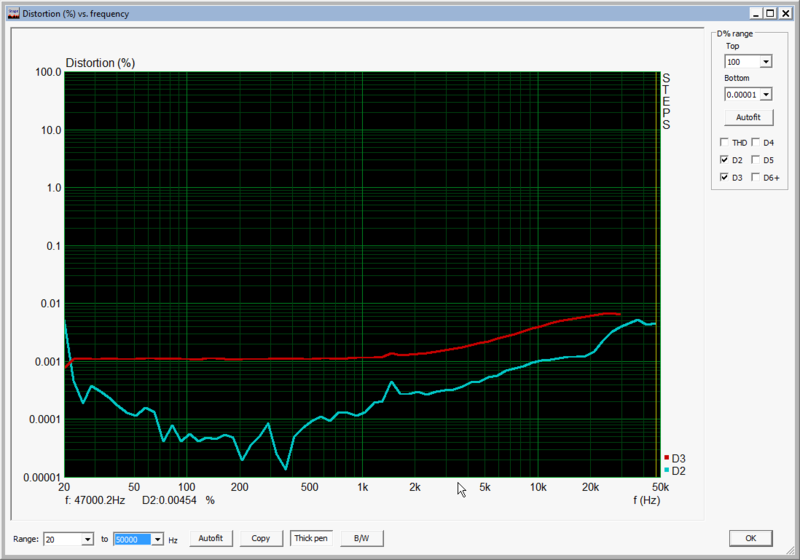 That means, the card is performing very well at the full range of sampling frequencies – great. Note, that the frequency scale is different – it now goes up to 50kHz. This entry was posted in Finished and tagged distortions, measurements, sound card on October 26, 2013 by Daniel.